Although counting continues, it seems that the first post-RAMSI election has been a success. This week the Solomon Islands held the country’s first election since the withdrawal of the Australia-led Regional Assistance Mission to Solomon Island (RAMSI) in June 2017. The security mission was able to successfully re-establish stability and functionality to the country after a period of ethnic violence from 1998 to 2003. During this period hundreds of people were killed, ten of thousands displaced, and the state was brought to the brink of collapse. The RAMSI mission was designed not simply as a peacekeeping operation, but as a program to rebuild the state. This week’s election was a critical test of RAMSI’s success. The poll will elect 50 members to the National Parliament in single member constituencies using the first-past-the-post system. Each member will serve a four year term. Despite a population of just over 600,000 people, the electoral process remains logistically complex. The Solomon Islands comprise six culturally distinct main islands, with another 900 hundred smaller islands, and 70 languages spoken throughout the territory. Many of the islands have limited connectivity, with helicopters being provided by the Australian and New Zealand defense forces to enable the electoral commission to reach poorly connected islands, and remote mountainous regions. Electoral politics in the country is equally complex. The web of reciprocal social obligations in the Wantok system that is custom in Melanesian societies leads voters to favor kin and local language groups to be their representatives. This makes an overarching party system difficult to form, and governments inherently unstable, with members lacking a unifying set of ideals and commitments. In the 2014 election, 32 of the 50 seats in the legislature were won by independents. The priorities of members of parliament therefore remain local, with politicians expected to simply direct goods to their family and supporters in their local constituencies. Good governance of the country as a whole is of limited concern. The system also makes it difficult for women to gain traction in the country’s political structures. Of the 335 candidates who ran in this election, only 25 were women. Due to the lack of a strong party system, the formation of a government could take several weeks to negotiate. However, despite the predominant localism of politics in the country, there are still pressing national issues that require careful attention. The Solomon Islands is one of six Pacific Island states that have diplomatic relations with Taiwan. Beijing has lobbied these states to switch recognition, and attempted to convince the Pacific Island Forum (PIF) to adopt a “One China” policy. Prior to the election, a review of the relationship with Taiwan was being conducted by the Solomon Islands government. Despite a lack of diplomatic relations with Beijing, China is the Solomon Islands largest trading partner, with this trading relationship largely driven by lumber exports. The felling of tropical forests is proceeding at an alarming rate, with considerable knock-on effects for local ecosystems and food supplies. How the new government is able to respond to this situation, balancing the much-needed revenue created by Chinese demand for lumber with the serious environmental concerns this creates, will be a major issue to confront for the next four years. The primary test to the country, its ability to conduct an election securely in the absence of the RAMSI peacekeeping forces, seems to have been passed (a small number of Australian troops were present for logistical support). Reports from the Electoral Commission indicate that polling was conducted smoothly, with no serious disruptions. Election eve, known locally as Devil’s Night, in previous elections was a highly charged atmosphere, with candidates and supporters engaging in widespread scare tactics and vote-buying. A ban on campaigning and on the sale of liquor was implemented to try and maintain a calmer election eve environment. The most significant problem seemed to be the requirement that people vote in their home constituencies, leading to a large exodus of people from the capital, Honiara, in the week leading up to the poll. Although as counting continues there remains some concern that violent protest may emerge if certain candidates are not elected, it seems that the first post-RAMSI election has been a success. The objectives of the RAMSI mission were not solely to rebuild the country’s governing structures, but to create greater public trust in the country’s institutions, something that had broken down in the years of violence around the turn of the century. The government looks to have successfully planned for any security threats, and the electoral commission executed an effective process to consolidate these trust building measures. 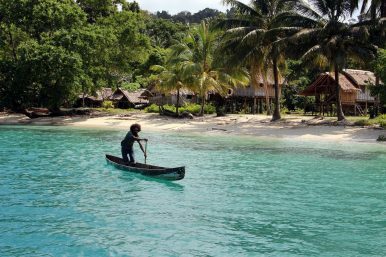 RAMSI Ends: What’s Next for the Solomon Islands? The mission was devised not simply as a peacekeeping operation, but as a program to rebuild the state.